what's the best way of spending a saturday afternoon? waiting in line for food is probably the last thing one would imagine themselves doing but that was exactly how ryan and i spent ours. two words : hot doug's. 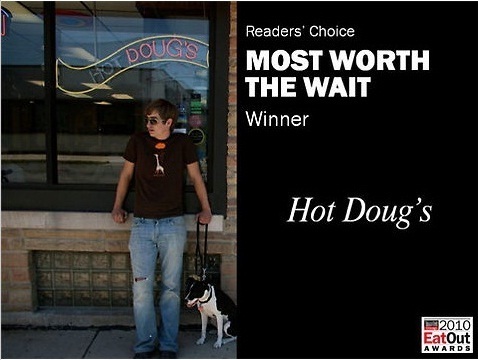 in fact, timeout chicago magazine recently crowned this hot dog stand as the most worth the wait winner for the 2010 eat out awards. on saturday afternoon, we drove to 3324 north california, chicago searching for this petite hot dog place. and we could immediately recognize where it was from the queue outside of the store. we were slightly taken aback by how ridiculously long the line was..
that was the beginning of our wait - at 2:25pm, to be precise. we tried to kill some time with me teaching ryan some korean and japanese that i've learned. we were inching rather slowly towards the entrance of the store. this line was probably longer than our first time at xoco. at 3pm, my tummy was grumbling but it was really my fault since i didn't have much of a breakfast. thank goodness for such a beautiful afternoon where the weather was sunny and the temp was just right. we also entertained ourselves by people watching and "eavesdropping" to the conversations around us. haha. the closer we got to the door, the more excited i felt. i looked at the time and realized it was 3:30pm when we got to the front entrance of hot doug's. and i could smell the yumminess and my tummy started grumbling.. i need me some food, dude! the place was brightly painted with yellow, blue and red with a ton of hot dog themed vintage posters which is totally fun and groovy. the one good thing about waiting in line is that we could take our time looking at the menu and deciding what to order. they have quite an extensive menu of hot dogs and sausages and we couldn't quite make up our minds what to get. they have their usual menu and specials menu that changes periodically as well as a game of the week. and of course, their famous duck fat fries which is only available on fridays and saturdays. they have such awesome names for their selections. :) we were definitely getting two of their specials and one regular hot dog to see how they fare at the classics. and needless to say, we were gonna get us the-much-raved-about duck fat fries. oh, before you go ordering every single thing on the menu, hot doug's accepts cash only. JUST CASH! 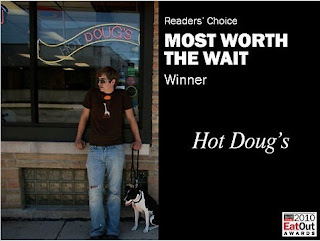 as we walked up to the counter, we saw doug - the doug of hot doug's! doug is super nice and friendly and didn't rush us for our order even with the long line behind us. we ordered the duck fries, the foie gras sausage, the mountain man sausage and for the classic we ordered the salma hayek which is the andouille sausage. but doug kindly suggested caramelized onions, mustard and pickle to go with it since we looked absolutely clueless and slightly panicky. lol. we gratefully complied with his suggestion but requested to have the pickle on the side. we found ourselves some seats by the window (lucky us!). our order was served just minutes after we were seated. it was time to try for ourselves what this hype was all about. i wanted to start off slowly and with the familiar so the first sausage i tried was the andouille sausage. a good amount of condiments topped the hot dog which i could see was seared well. first bite was so delish. first was the crispy sear then the snap of the casing followed by the moistness of the sausage. it has the slight spice (not even close to spicy hot) with the familiar flavors of what andouille should be which pairs well with the tang of the mustard and sweetness of the caramelized onions. and this is cushioned in a soft, fresh hot dog bun. we actually didn't need the pickle. ryan said it reminded him of home when he took a bite (he's from louisiana - andouille capital of the world!). the best parts are the ones at both ends because of the extra crispiness so you can begin and end with the yummiest bites. when i saw the sear on the sausage, i immediately thought this was rather promising. as i bit into it, i immediately recognize the duck flavor in the sausage which is enhanced by the foie gras mousse that melts in your mouth. the truffle aioli has a distinct truffle flavor but was not overpowering. all these make up a really good combination of flavors. the sausage paired so well with the richness of both the mousse and the creamy and earthy aioli. just as it was with the other sausages, it had the snap that i look for in a great sausage and the moistness on the inside. yummy! i wanted to try this mainly because i have never had any of the meat listed in this sausage and thought i might be a lil adventurous. ryan wasn't too sure about getting it because these meats are all lean so there's a possibility that it might turn out to be dry. the first bite i had, it definitely wasn't dry but i had some trouble figuring out how the sausage is different than any other in terms of flavor. then when i took a bite of the sausage with just the bun, there was a subtle gamey-ness that i was expecting and searching for. the smokeyness of the dressing aided in this sausage's campaign to greatness which also added to the moistness of this flavorful hot dog. however, if there were any bacon in the dressing, i couldn't taste it. the vintage van gogh cheese (which is an aged gouda) has a sharp flavor similar to cheddar but with bitter undertones. ryan was particularly fond of the cheese. despite the non existent of the bacon flavor, the combination of flavors is really tasty. this was the reason why we came on a saturday despite the extra long lines. sad to say, we were disappointed by the fries. it didn't have any special flavor from frying in duck fat. and searching for one crispy stick of potato was a futile effort because it was mostly soggy. maybe it was just sitting at the counter for too long or maybe it wasn't a freshly fried batch of fries. but it definitely wasn't anything special. nonetheless, this less-than-spectacular fries wasn't enough to dampen our experience at hot doug's. hot doug's offers an american classic in a fantastic fashion (think of their regular menu) and amazes us with out of the ordinary sausages that is familiar yet adventurous in its own way (think their specials menu). so the golden question: was it really worth the an hour and half wait? so yes, definitely! and i would totally do it again. i am uber excited about it. if you're wondering what it is.. it's a new polaroid camera : a fujifilm instax mini 25!! anywho, when i got my package last week, i was so happy to get it and couldn't wait to open it! so cute! all pretty in white and it has the much needed flash which lacked on my polaroid sx-70. 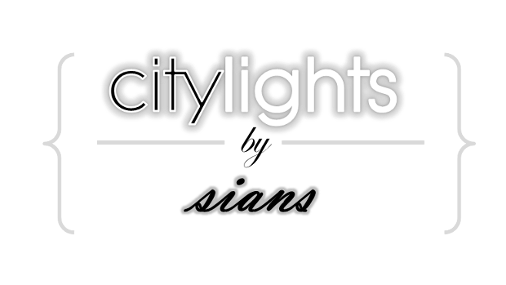 there is also an exposure control for light and dark setting. in terms of size, it's a lot lighter and thinner. perfect for travelling! it is super easy to get it all set up. all i needed to do is to load the batteries (CR2) which are included, load the polaroid pack, turn it on and voila! this camera takes mini polaroid pictures the size of credit card but retains that classic instant film look that i love. there are two trigger buttons - one for horizontal and the other for landscape photos. it also has a detachable close up lense (less than 2 ft) and a front facing self potrait mirror which is perfect! :) i actually can't wait to see what kind of pictures i can take with this instax this weekend. should i give my polaroid camera a name? haha. other news, ryan surprised me by sending a package my way a few weeks ago and he got me this awesome book: the flavor bible! i haven't really had time to look at it carefully but it does a lot of the flavor matchmaking which is awesome if i wanted to come up with new recipes and such :) now i just gotta find some time to do some cooking experiments of my own..hehe. last friday, my friends at work and i decided to try something new for lunch. this entry is somewhat long overdue but i've been feeling a lil under the weather this past week. christina suggested puck's restaurant at the museum of contemporary arts just two blocks away from my workplace. i didn't even know they had a restaurant in there! i was somewhat starving as we walked towards puck's restaurant. the restaurant that is the brainchild of wolfgang puck and the mca is located at the back of the museum just as you enter the main entrance. diners can enjoy their lunches (11:30am - 2pm) from tuesdays to saturdays in the full-service restaurant or purchase them at the express counters or try their sunday buffet brunches from 11am to 3pm. puck's restaurant centers around seasonal ingredients that draws on Asian and Mediterranean influences, hence their menu changes periodically. that is also the idea behind their puck's tuesdays on the terrace that happens between the months of june till september where they serve different international dinner buffet every week. we were tempted to try a lot of the dishes on the menu because they all sounded so good but we decided to share three dishes: a salad, a pizza and a main entree. they started us off with some bread and a spread to go with it. the bread tasted fresh but the one that i loved most was the olive ciabatta. it has a dark hue with some bits of olives in the bread. the corn bread was slightly sweet, buttery and crumbles in your mouth. the spread was really tasty - with flavors of chopped olives and garlic and oh so good. there are two parts to the dish: the crab meat that was tossed in lemon juice, sitting comfortably between the layers of cubed avacado and diced tomatoes. this is paired with a salad of microgreens and halved cherry tomatoes. i particularly love this salad the most out of all the dishes i've tried here. it's light, it's refreshing and it's yummy goodness. the sweetness and freshness from the crab meat, the butteriness of the avacado then the suprising crunch from the sliced red onions, the greens and the thinly sliced carrots, the quick hit of tartness from the pomegranate seeds and the burst of flavor from the cherry tomatoes. my mouth waters a lil bit just thinking about it. in my opinion, this pizza crust had the crunch of the thin crust coupled with the slight doughiness of a regular pizza which i like. my guess is thin crust pizza purists might be upset with the crust but i do like my pizza crust more towards regular pizza doughiness. there was a generous amount of perfectly melted fresh mozarella and i loved the bites with the fresh sliced tomatoes. i kinda wished that the basil was distributed more evenly thoughout the pizza and would probably have preferred the basil leaves whole instead of chiffonade to give it the burst of sweet basil flavor that i thought this dish needed. this dish looked so good when it got to our table and i couldn't wait to get a slice of the chicken that was seared ever so perfectly. as i suspected, the chicken skin was very crispy and so delish. but we were a bit disappointed that the well seasoned chicken breast was a tad dry. good thing that it was compensated with the sweet and smooth sweet potato puree that gave it the extra moistness that it was missing. it paired well with the sauteed green and yellow squash for the extra layer of flavor but i didn't quite taste the apple cider reduction. i still liked the dish nonetheless but it wasn't anything spectacular except for maybe the perfectly seared chicken skin. overall, puck's restaurant delivered what they promised: seasonal and fresh ingredients in simple and classic dishes. there are a few more dishes that we would like to try but i think we're saving that for our next visit to puck's restaurant at the mca. i had a dinner party all planned out for round three of pfb but unfortunately, i didn't advance through to the third round. but i'd still like to thank those who voted for and supported me throughout the competition and it was good fun even though it was short. regardless, the dinner party must still go on for my friends! prep-ing started the night before and i started cooking at 11am on the day itself. but there was a lot of playing wii and watching tv involved in between cooking and prep-ing so things might have gone slower than it should have. hehe. but i have to say i am rather proud of myself because i did everything all on my own! a bruschetta is a hearty appetizer originated from central italy which consists of grilled bread rubbed with garlic and topped with extra virgin olive oil, salt & pepper. a classic bruschetta is usually topped with roasted tomatoes, basil and grated parmesan cheese but i decided to try different toppings instead. i started with toasting the base of the bruschetta - slices of ciabatta which i drizzled with extra virgin olive oil and toasted at 400F for about 10 minutes until golden brown. this recipe is from a friend (who used to be my boss). spread a layer of soften cream cheese (just easier to work with), followed by a layer of olive tapenade. actually, olive tapenade is the reason why i started liking olives and it started with this exact appetizer that i had a year ago. i made a slight modification to the recipe by adding a slice of tomato on the top to give it the slight sweetness and freshness. and if you want to add a bit more color and another layer of flavor, you could also add basil leaf. bruschetta trio | bruschetta with ricotta and lingonberry. this bruschetta is inspired by a recipe by giada de laurentiis: bruschetta with ricotta and orange marmalade. a very simple and quick recipe and the change i made is i substituted the orange marmalade with lingonberry jam. i got the lingonberry jam from ikea and thought it might be a good way to incorporate the tart and sweet flavors of the jam with the 'melt-in-your-mouth' texture of ricotta. you can probably use whatever spread you'd like. another giada de laurentiis' recipe on food network. the first part is to sautee the spinach with some evoo, garlic and crushed red pepper. i think i was went a lil heavy on the crushed red pepper so it was kinda spicy. i stacked a generous amount of spinach on each slice of ciabatta that i rubbed with fresh garlic after it was cooled for 5 minutes. and then i topped it off with shredded fontina cheese which was then melted in the oven at 400F for another 10 minutes. this bruschetta has some spiciness from the spinach and the slight bitterness of the melted fontina makes this quite a satisfying appetizer. coq au vin means chicken cooked in wine in french. a classic french dish with a lot of steps involved in the process. i've made this once before a year back and thought this would be a hearty and comforting dish for a chilly evening. there are a lot of recipes online but the coq au vin recipe that i've tried and loved is from alton brown. the cooking process for this dish starts the evening before. it includes rendering the bacon fat, sautee-ing the pearl onions, searing the chicken thighs, cooking the mushroom and then putting the chicken pieces into the dutch oven with the other ingredients to marinade it overnight. the bacon, pearl onions and mushrooms are kept in a separate air-tight container. after marinading it overnight, the chicken turned a lil purple which is totally normal. the next step is to cook the dish at 325F for about 2.5 hours. the aroma of the dish wafted through the kitchen and it made me really hungry. the few final steps were to put the chicken aside, strain the sauce to reduce it by a third (30-45 minutes) and then thicken it with some flour and butter and then finally adding all the ingredients to warm it all up before serving on a bed of fluffy couscous. for the side, i decided on roasted asparagus drizzled with balsamic reduction. to roast the asparagus, coat the asparagus with evoo and season with salt and pepper on a baking sheet and roast it at 400F for 15-20 minutes depending on the thickness. the balsamic reduction recipe is from sunny anderson and it paired well with the coq au vin. btw did i mention i loveeeeee asparagus? i wanted to make something light but sweet to end the meal with and pavlova came to mind. pavlova is a meringue-based dessert where it has a light, crispy crust encasing a soft, marshmellow-y inside. it took me almost an hour to prep all the ingredients and it takes another 50 minutes to bake in the oven. i had to be really careful and gentle while transferring the cooked pavlova so not to crumble the fragile outer crust. to make the sauce, i used frozen unsweetened mixed berries and added some sugar and lemon juice and cooked it for about 20 minutes over medium heat. i topped it with slightly sweetened whipped cream that i made. the pavlova was a just a tad too sweet so i'd probably reduce the amount of sugar in the meringue by about half a cup. but it was a pretty light dish and the sweetness was slightly evened out by the tartness of the mixed berry sauce.